BTX Technologies has released a Mersive approved appliance solution for Solstice collaboration software. This solution comes with everything needed to make a boardroom or classroom collaboration ready. Solstice enables multiple presenters to connect simultaneously to a shared display using a range of devices over an existing Wi-Fi or Ethernet network. With a Solstice-enabled display in a meeting room, any number of presenters can instantly connect, share and control the display, fostering collaboration and decision-making. In addition, enterprise customers can use the Solstice Dashboard to centrally manage all of their Solstice displays across their corporate network. Two versions of the BTX Solstice Appliance for collaboration are available - one for unlimited presenters and one for up to four presenters, and each come with an option for an extended software maintenance period. The hardware is the same in each solution, allowing an easy upgrade from Solstice SGE to Solstice Unlimited if room requirements change. The appliance solution includes a windows operating system, keyboard, mouse, power supply and the Solstice by Mersive software. 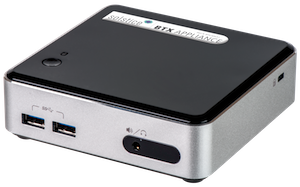 The BTX Solstice Appliance is optimized to run Mersive Solstice Display software. This configuration is locked down, making this a truly plug and play collaboration appliance. For those that want the freedom to have the hardware available for other uses, there is a bundled solution available without the optimizations described above. "With this solution, it is our goal to make collaboration systems both simple to use and easy to install." said Greg Schwartz, president of BTX. "The form factor is so small that it can be easily moved from room to room if so desired and the solution is at a price point that makes it extremely compelling."